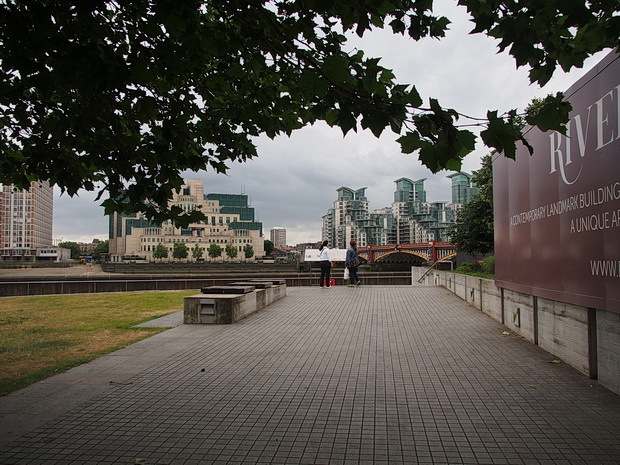 Here’s a series of photos taken from a short (2.7 miles/4.5km) walk I took recently from Vauxhall tube station (Victoria Line), along the Thames to the north side of Blackfriars Bridge. 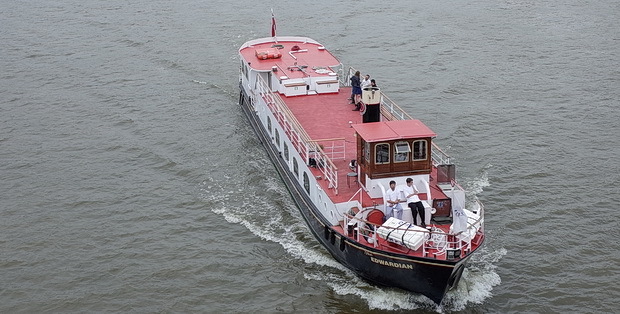 Crossing over the Thames at Waterloo Bridge, I captured ‘The Edwardian’ vintage cruiser heading east. 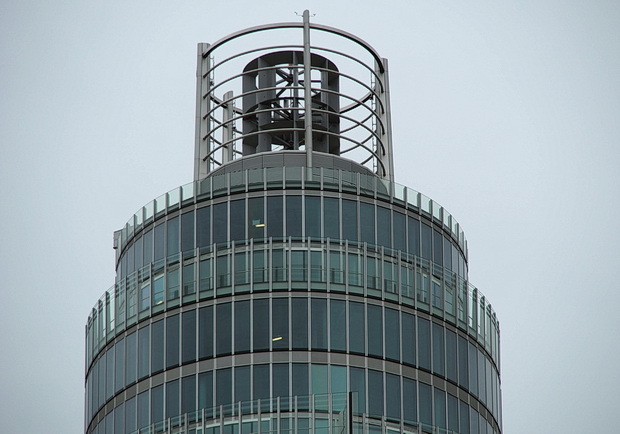 The top of the St George Wharf Tower (Vauxhall Tower) new development. At 50 floors, it’s the tallest residential building in the UK. Sadly, the tower is already linked to two deaths after a helicopter crashed into the crane at the top of the construction in January 2013. Both the pilot and a pedestrian at street level lost their lives. 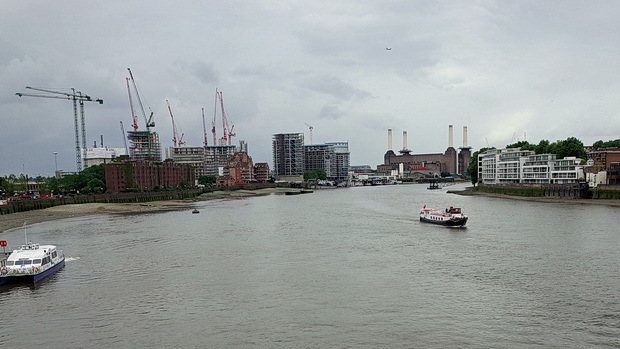 Looking west with two of the chimneys of Battersea Power Station visible to the right. 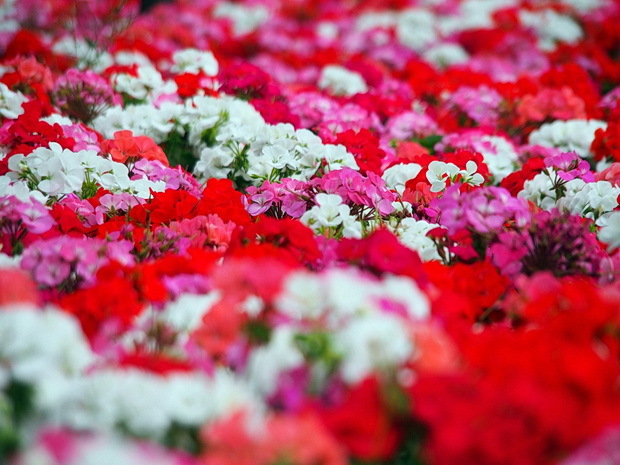 Floral display on the north side of Vauxhall bridge. 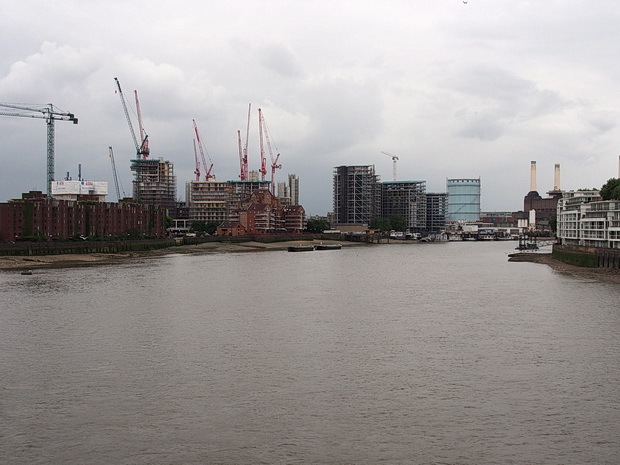 Looking across to the private residential developments on the south side. 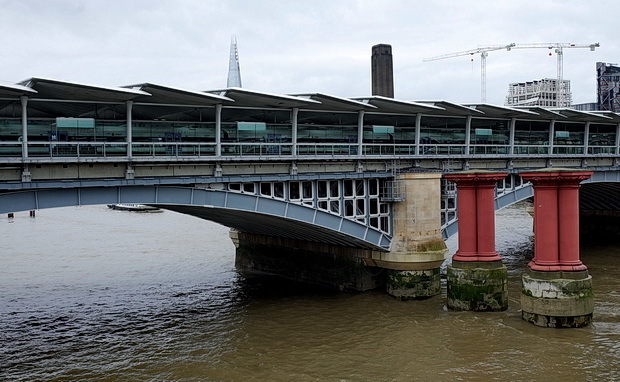 Completed in 1906, Vauxhall Bridge replaced an earlier 1816 bridge that was built on the site of a former ferry crossing. 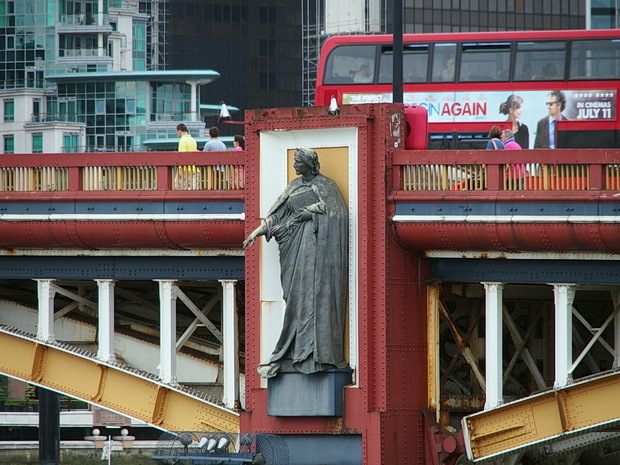 The bridge contains eight statues, each weighing two tons. 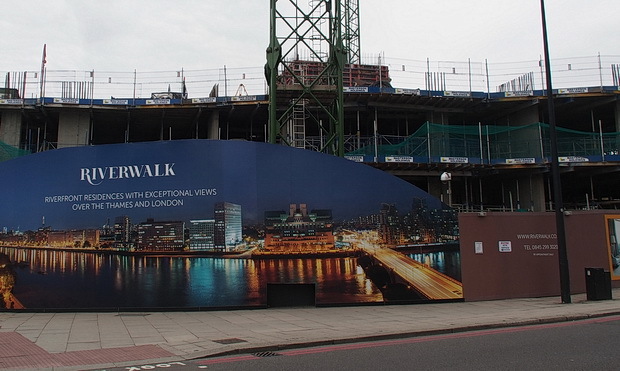 The ghastly exclusive ‘Riverwalk‘ development under construction. 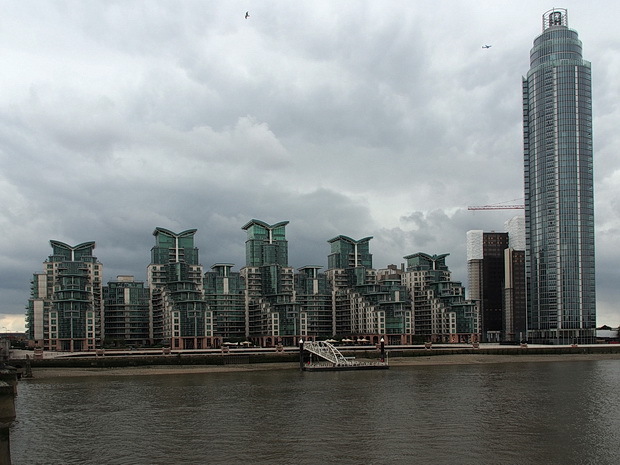 Rich people get to live right on the river and block the view of others. It suits their ‘lifestyle’ apparently. Bespoke Boffi designer kitchens with integrated Miele and Gaggenau appliances, luxury bathrooms with feature marble walls, Dornbracht accessories and underfloor heating. Apartments also have comfort cooling to all reception rooms and bedrooms, beautiful flooring and high quality carpets in bedrooms, Crestron architectural lighting and a Crestron home automation system. 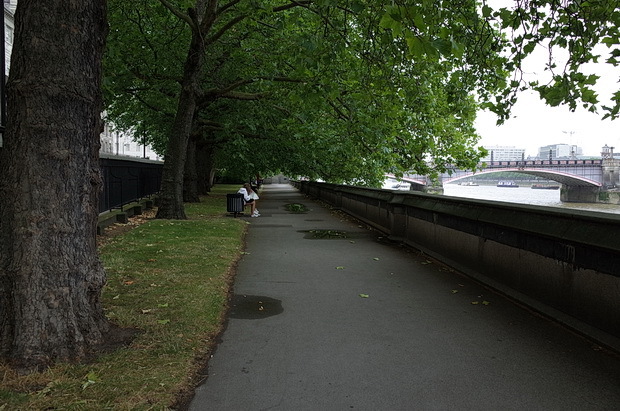 The small Riverside Walk Garden park to the east will be dominated by the new build. Landscaped in 2004, the park is built on a former dock where criminals being transported to Australia boarded their ships. 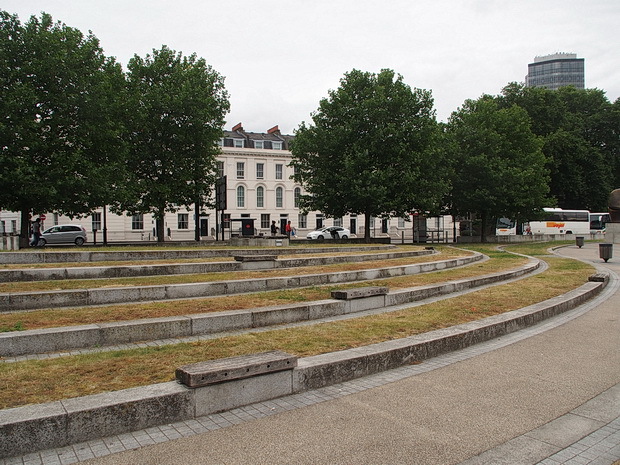 Near this site stood Millbank Prison, which was opened in 1816 and closed in 1890. 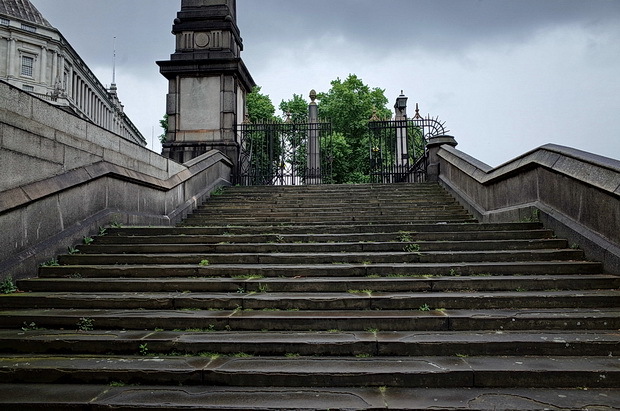 This buttress stood at the head of the river steps from which, until 1867, prisoners sentenced to transportation embarked on their journey to Australia. 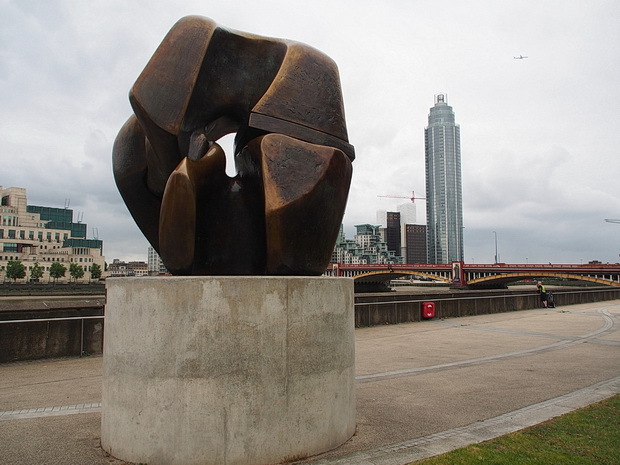 The garden is also the home to a major Henry Moore artwork called, the “Locking Piece,” created in 1963/64. 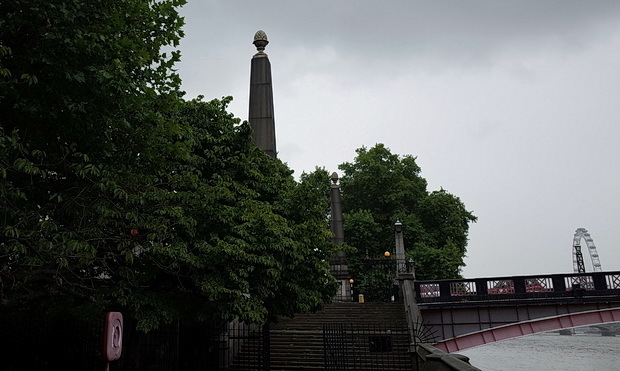 Lambeth Bridge features pairs of obelisks at either end of the bridge, which are topped off with stone pinecones. 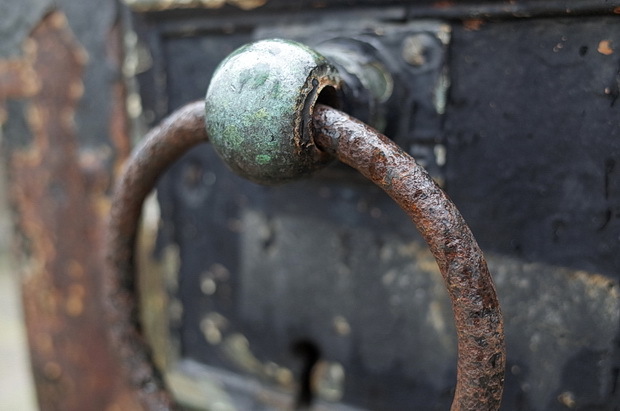 Detail from old iron gate leading up to Lambeth Bridge. 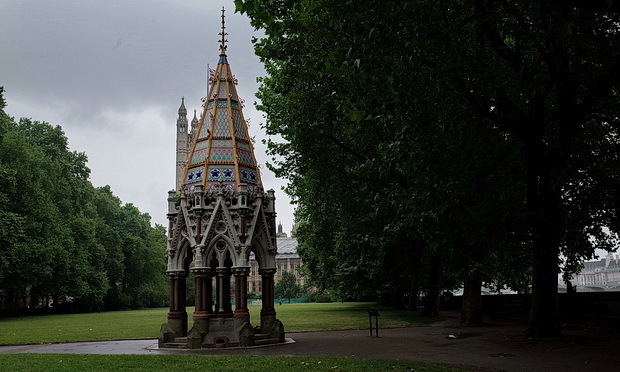 The ornate Buxton Memorial Fountain, which commemorates the emancipation of slaves in the British Empire in 1834. Designed by Gothic architect Samuel Sanders Teulon in 1865, the memorial originally stood in Parliament Square, before being moved to Victoria Tower Gardens in 1957. 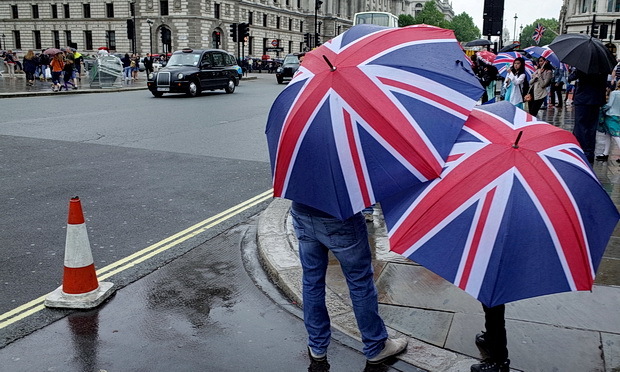 Walking past the tourist hordes outside Westminster. 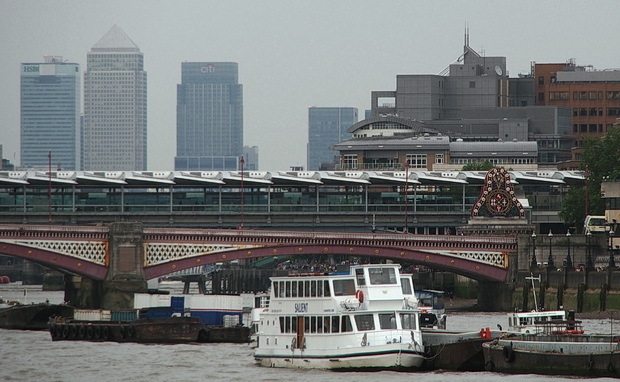 Looking east, with the new Blackfriars station in the foreground, and the towers of Canary Wharf in the distance. 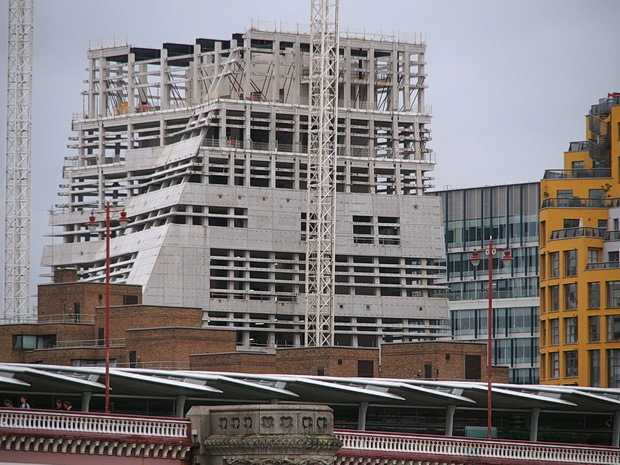 A not entirely pleasing-looking new building under construction. Another look at the new station, which is now the the world’s largest solar-powered bridge. You can see two of the columns from the old rail bridge in the foreground. Read more about the old bridge here. 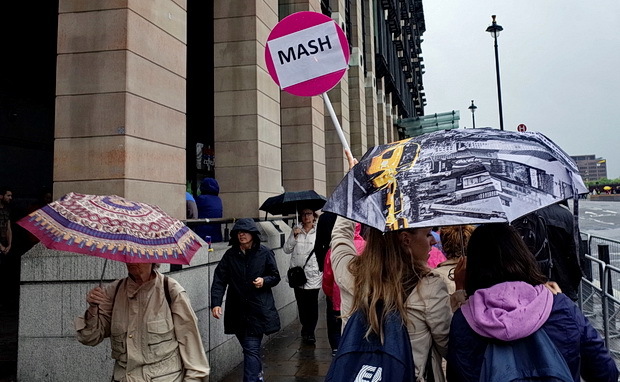 See the walking route on a map. Unfortunately, your new architectural construction is just as hideously ugly as is our’s here in New York City.